. . . And we're through the conventions without any shootings. In fact, it now feels sort of ridiculous to have feared violence in the first place -- though I'm pretty sure it wasn't. So give me a moment to start breathing again. 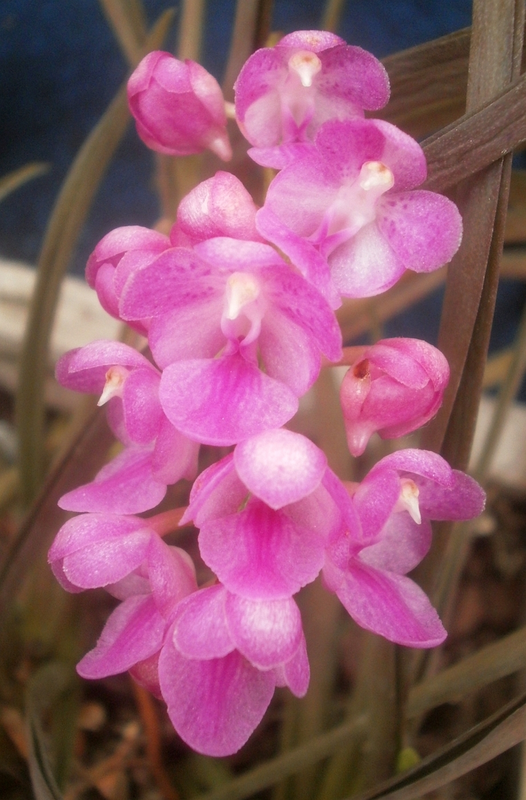 Aerides krabiensis is a lithophyte1 according to Wikipedia, but the photos I ran across didn't show it being cultivated that way, so it must be more flexible than that makes it sound. Most of the on-line photos also show green (sometimes bright green) leaves, too: not sure if this specimen was miserable or just caught at a particularly bad moment. 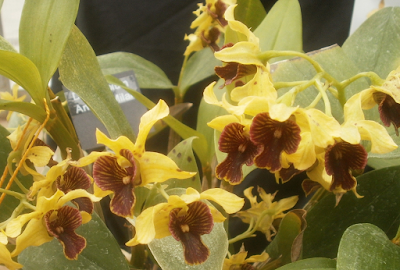 The flowers are supposedly fragrant, but as usual, I'm unable to confirm this. The common name for the genus is "cat's-tail orchid" or "fox brush orchid," which I imagine makes more sense if you're looking at an older specimen with a longer stem. In other news, four out of five pots of Amorphophallus have now leafed out; the one straggler has a leaf emerging but it's doing it so slowly. I won't make any promises about when, exactly, but I do expect to start making some non-orchid posts soonish, so you'll probably be seeing the Amorphophalluses eventually, as well as several other things. I'm thinking about ending the orchid-only posting after this week, but no promises; I'm enjoying the break from blogging a lot more than I expected to (I even have time to work out again!). And I still have the problem that nothing new is happening with the plants: lots of new Anthurium blooms (and one very late Schlumbergera), just like it was before the break. We'll see. Meanwhile, there is an orchid to consider. I'm unhappy with the photos I got. I don't remember it being nearly this intense of a yellow in person, and the blooms have a sort of . . . hunched-over? look to them that I'm not particularly into, where the tepals bend over to cover the lip. The number of blooms is impressive, I guess, but I'm actually more interested in the foliage, particularly how broad the leaves are. I haven't seen a lot of Dendrobiums with leaves like this. The patterning on the flowers' labellums (labella?) is interesting, too; I wish it had photographed better. 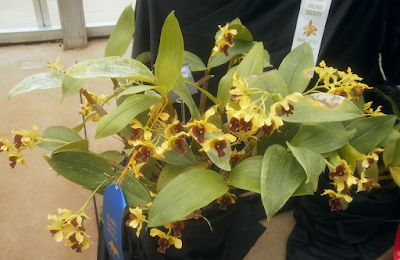 I couldn't confirm this one at the International Orchid Registry site, but I don't know why. I did find it elsewhere on the net, so I assume it exists, but it's weird for something not to be in the IOR database. The photos I found elsewhere on-line don't match my pictures very closely -- in particular, a lot of them have purple lips, rather than brown, as my photos show. The closest match I found was at davesgarden.com. and I suppose I'm prepared to believe that that's the truth. 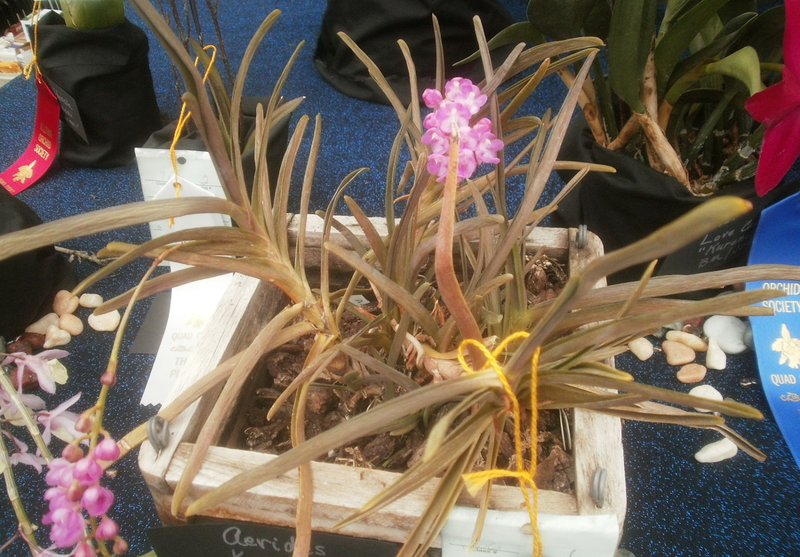 This is the first time I've seen this particular plant at the orchid show, but there have been some relatives in previous shows, which all look like Den. Andree Millar to some degree or another. 1 No, seriously. I mean it. 2 I feel like there might be bipartisan popular support for limiting the length of our election cycles, as many other countries already have. It's certainly no fun to be in a early primary/caucus state, which is also a swing state, for the 24 months leading up to an election, and I bet residents of New Hampshire would back me up on this.